Seventy-five six-foot tall Mickey Mouse statues begin their visit at Disney's California Adventure. They will be on display until February 22. Actor Ray Bolger is born in Dorchester, Massachusetts. 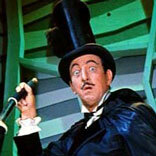 Best known for his role as the Scarecrow in The Wizard of Oz, Bolger played the role of Barnaby in Disney's 1961 live-action feature Babes in Toyland. He was also one of many celebrities who took part in Walt Disney World's three-day opening festivities in October 1971. Disney's Alice Comedy film Alice the Golf Bug is released. his Uncle Walt after graduating from college in 1951 as an assistant director. top Disney executives: first, Ron Miller in 1984, and then Michael Eisner in 2005. As the last member of the Disney family to be actively involved in the company, Roy E. Disney was often compared to his uncle and father. the first Disney character to make his first appearance in a comic strip outside "The Mickey Mouse Universe." Broadway show Aida) at the 25th Annual People's Choice Awards broadcast on CBS-TV. Disneyland Paris welcomes its 100-millionth visitor; Stefan and Andrea Seyffardt and their daughters Lisa, 6, and Marie, 4, from Germany. Recess, the film will be generally released the following month. Stevie, Lalaine as Ruby and Tim Reid as Larry. The soundtrack includes "You Wish!" sung by Lalaine. animated version. An "opening night after party" takes place at the Roseland Ballroom. a job that Donald does not exactly enjoy. Japan, wins the Women's Overall with a time of 2:51:20. An 18-year-old named Joyce Clyde Hall from Nebraska steps off a train in Kansas City, Missouri for the first time. Equipped with little more than two shoe boxes of picture postcards and his entrepreneurial spirit, he will start what today is Hallmark Cards, Inc.
Disney's Hollywood Pictures releases The Hand That Rocks the Cradle, a thriller starring Rebecca De Mornay as a vengeful nanny out to destroy a naive woman and steal her family. The 9th Annual VES Awards will take place on Tuesday, February 1, 2011 at the Beverly Hilton Hotel. guest interviews include one with Walt Disney. President Robert Iger announces that the main animation building in Burbank will be renamed the Roy E.
The twelth episode of Disney's Recess, "The Voice/Kids in the Mist" premieres on ABC-TV. guests can attend a show inspired by the world-famous Frontierland stage production, through February 4.
nominated for Best Short Film Animated. The 85th Academy Awards ceremony will be presented on February 24.
edges teammate Mike Morgan to place first. Both from Lake Orion, Michigan, Humphrey wins with a time of 1:08:56.
cross the finish line with a time of 1:16:25. Brazillian Fredison Costa wins the Walt Disney World Marathon for the fifth time! than three hours with a time of 2:52:23.
the Disney Channel. Debuting in December 2011, the series ran for 4 seasons. who worked in vaudeville, Tracey arrived in the United States when she was 4 and learned to sing and dance. She nabbed a spot on "The Mickey Mouse Club" when she was 12.